Frank used to be a musician. He met his wife performing, and the two of them made music together -- and eventually had a daughter, Sam. But Frank's music career never really took off, and after his wife died in a tragic accident, Frank left the business to open his own record shop and raise his daughter on his own. He's done an okay job - his daughter is brilliant, about to leave for UCLA's pre-med program - but he's sick of selling other people's music; he wants to make his own, again. In comes Sam, who has a knack for songwriting and killer pipes. Together, the two spend the summer before Sam goes away to college making music, dealing with heartbreak, and trying to figure out what comes next. 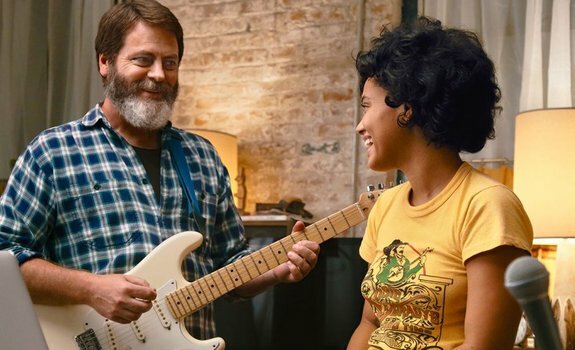 Hearts Beat Loud is a musical in the same way Once was, with musicians playing for one another and writing music influenced by the events of the film, rather than spontaneously breaking out into song. Rather than a potential romance, however, the music of Hearts Beat Loud gets at the sometimes messy father-daughter relationship between Frank and Sam. The movie avoids a lot of the obvious conflicts. Sam is a lesbian, but her father already knows at the start of the film, and it isn't at all an issue. And when she starts pushing at the boundaries of Frank's rules, he reacts reasonably. The film's drama typically comes from more intractable problems, and more relatable ones; part of the charm of Hearts Beat Loud is that these are characters who all like and care about one another, and the movie's heartfelt sentimentality fits the musical genre - and the music - perfectly. The cast of Hearts Beat Loud is truly phenomenal. Nick Offerman is finally given the chance to break out of the Ron Swanson mold as Frank Fisher, a former musician who never quite broke through. Now he's a jaded older guy who owns a record store in Red Hook, playing him like John Cusack in High Fidelity twenty years - and a dose of tragedy - later, still snarky and a bit juvenile but less judgmental and cruel. But his daughter, Sam (Kiersey Clemons), brings out the best in him -- and in the film. Smartly, rather than focusing just on Frank, the movie gives Clemons equal time and an arc of her own. Her romance with Rose (Sasha Lane) is brief but ultimately surprisingly affecting; by their final scene together, I was completely in love. Clemons plays Sam like someone who badly wants to break out of her shell but has always had to be in control of herself and doesn't quite know how to let go, and her arc built to a surprisingly affecting climax. The supporting cast is equally strong. Ted Danson gets back behind the bar as the goofy pothead owner of a local bar and friend of Frank, and he's a delight in every single scene. Danson nails the relaxed, aging stoner vibe flawlessly. Toni Collette has a slightly tougher role as Frank's landlady and potential love interest, who seems torn between being Frank's business partner, friend, and lover, but Collette brings an effervescent charm to a character that could have felt a bit muddled. Blythe Danner is the only supporting cast member who feels a bit wasted; she has a small role as Frank's aging mother, but her small role doesn't give her much to do, and the film seems a bit lost as to why she's in it. The music of Hearts Beat Loud is surprisingly excellent. The titular track is an upbeat indie rock pop song that could have easily become grating, as you hear it - or pieces of it - five or six times throughout the film; instead, it just becomes catchier every time. A small, intimate number Offerman sings for his daughter provides a vital emotional beat to the film; Clemons' love song to her new girlfriend, Rose, is sweet and sad. The film's use of music is smart, but beyond that, songwriter Keegan DeWitt managed to craft affecting songs that fit the modern indie rock landscape flawlessly while also functioning as powerful emotional punctuation. And, just as impressive, the singing is done live in film by the actors, a trick that ends up working far better here than it did in Les Mis a few years back. Kiersey Clemons in particular has a rock star charisma and a voice to match, and the movie knows it. The parts of Hearts Beat Loud are fairly simple, but the film's impeccable alchemy make it far more than the sum of those parts. Like the laidback pop-savvy films of Richard Linklater (Everybody Wants Some!! in particular, I think), the drama here doesn't always land, but you want to live in this world, with these characters -- indeed, you feel like you kind of already do. Hearts Beat Loud is an irrepressibly charming film, the kind of feel-good delight you rarely catch in indie film these days, and in a sane society, it would make Kiersey Clemons a huge star. It's light, but I suspect you'll fall in love. Hearts Beat Loud played recently at the Cleveland International Film Festival. It was written and directed by Brett Haley, and it stars Nick Offerman, Kiersey Clemons, and Toni Collette.